The AG2R La Mondiale team for 2010 has been presented on Tuesday 26 January, on the same day as the the Grand Départ of the 2011 Tour de France in the Vendée. Apart from the 8 days during which Rinaldo Nocentini got to wear the yellow jersey in the 2009 Tour de France, the team probably wants to forget this disappointing year as soon as possible in order to think about how to do better in 2010! 2009 has been quite disappointing for the French team based in Chambéry. Indeed, the riders of the team took only 5 wins during the whole year: one stage in the Tour of California for Rinaldo Nocentini, two stages of the Route du Sud for Nicolas Rousseau and Christophe Riblon, the Irish Championship on the road for Nicolas Roche and in August a stage of the Tour de l'Ain for Ludovic Turpin. The Tour de France, as usual the most important goal for this team, didn't give the expected results either, even though the Italian rider Rinaldo Nocentini managed to show off the colours of the team and the insurance company which sponsors it thanks to his 8 days in the yellow jersey. Indeed, on top of Arcalis in Andorra - there where Brice Feillu won the stage in a beautiful way - Nocentini finished 4th and took over the yellow jersey from Fabian Cancellara. It was only in Verbier, in Switzerland, that Alberto Contador took over the leader's jersey of the Tour from him. The team started this Tour full of hope and with something new: the new kit with the new colours of the AG2R La Mondiale group (brown and blue). Looking at the performance of the team, in addition to Nocentini wearing the yellow jersey, we see that the team ends at a 4th place in the team ranking (first French team). AG2R has been a sponsor of Vincent Lavenu's team since 1997 (at that time together with Casino under the name Casino-AG2R Prévoyance and since 2000 as the main sponsor: from 2000 till 2007 under the name AG2R Prévoyance and since 2008 under the name AG2R-La Mondiale) and the company itself says it's an opportunity to develop, for a relatively low cost, its brand value and the company's values. In addition to this, AG2R is a partner of A.S.O. since 2003 and the 2010 Tour de France will thus be the 8th for AG2R, but that's not all. Indeed, the 6 information and regulation motors with the colours of the insurance company will also be present in a big number of other races organised by A.S.O. : Paris-Nice 2010 and the Critérium International 2010 in March, Paris-Roubaix in April, the Tour de Picardie in May, the Tour de l'Avenir in September and finally Paris-Tours on 10 October 2010. The Tour however is of course the most beneficial for AG2R La Mondiale. Every year, the company asks the research bureau Occurrence to realise a report on the media impact on the Tour, both thanks to the sponsoring de of the team and to the partnership with the Tour. In 2009, especially thanks to the 8 days in the yellow jersey for Rinaldo Nocentini, AG2R La Mondiale generated an advertising equivalent of 60 million euros, a record. The method the bureau uses allows to estimate the amount of money the company should have invested in classical advertising to get the same visibility of its brand as the visibility it gets thanks to its sponsoring. Almost half of this advertising equivalent corresponds to the visibility of the brand on radio and TV. Knowing that the team represents a budget of about 7 million euros and that it also has some other (less important) sponsors, it becomes clear that the return of investment for the sponsoring of the French insurance company is quite high! The company also uses a study from TNS Sofres to say that 27% of the people who were interviewed remembered the team's jersey. This study also shows that 60% of the French population now knows the brand. Unfortunately, it doesn't say what that percentage was before the sponsoring, but one thing is sure: it was way below 60%. Yvon Breton, directeur général délégué of AG2R La Mondiale added to this: thanks to our riders, the sponsoring of cycling allowed us to get in touch with 2,5 billion people during the Tour 2009. As a comparison: in the Tour 2008 the advertising equivalent was estimated at 47 million euros (+60% compared to 2007; 2009 does +27,7%) for 2,8 billion contacts (-10,7% in 2009). Disappointed by the results of the team in 2009, Vincent Lavenu, the manager of the team, says that in 2010 we have to use our fundamental values which are team spirit and enthusiasm to get back to our usual level. The renewal of the team probably targets to improve the results. With 9 riders who left and 7 newcomers the team now has 28 riders. Julien Bérard (27 July 1987) is a very promising neo-pro, coming from AG2R La Mondiale's training team, Chambéry Cyclisme Formation. In 2009 this young French rider, a puncheur, took no less than 9 victories, including the GP de Saint-Etienne Loire, the 4th stage of the Ronde de l'Isard and the first stage of the Tour de l'Avenir. For these victories he got the Vélo d'or Français 2009 in the category espoirs. 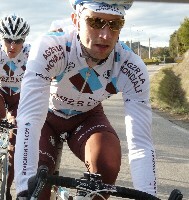 Maxime Bouet (3 November 1986) joins the AG2R La Mondiale team after the team where he became a pro rider in 2008, Agritubel, disappeared. Of his 5 professional victories, he got no less than 4 in 2009: one stage of the Trois Jours du Vaucluse (where he ended 2nd in the general classification, best climber and best young rider), one stage and the general classification of the Volta ao Alentejo in Portugal and the Boucles de l'Aulne. In his first Tour de France he finished 9th in one of the stages and 70th in the general classifcation. Maxime Bouet signed a 2 year contract with the team from Chambéry. Dimitri Champion (6 September 1983) honours his name since on 28 June 2009 he won the French Championship on the road. After becoming a professional with Bouygues Telecom in 2007 and one year with Bretagne-Schuller in 2009, Champion will now show his bleu/white/red jersey in the AG2R La Mondiale team in 2010 and in 2011 since he signed a 2 year contract. At the moment he signed this contract he said: I wanted to stay in France and the project AG2R La Mondiale proposed me both from a sports point of view as concerning the evolution of the team pleased me. I'm happy to be able to show off my Champion's jersey, in France and in a French team. I would like to obtains some good performances in races like Paris-Nice or the Tour de France. 2009 was probably his best year as a professional so far, when you look at his victories: he became Champion of France, he won the Tour du Finistère and the Circuit des Ardennes. He also finished 2nd in the Boucle de l'Artois, 4th in the Trophée des Grimpeurs and 7th in the same French Championship as where he took his national jersey, at the time trial. Ben Gastauer (14 November 1987) is a Luxembourg rider who makes his pro start with AG2R La Mondiale this year after having joined the team as a trainee at the end of last year. Coming from Chambéry Cyclisme Formation, this complete rider showed in 2009 that he was ready to start his professional career by getting 8 victories: he became Champion of Luxembourg espoirs both in the time trial as on the road and he won the Vallée du Bédat, a stage and the general classification of the Transversale des As, the Trophée Clermontois and a stage and the general classification in the Tour des Pays de Savoie. Kristof Goddaert (21 November 1986) joins the team AG2R La Mondiale from Topsport Vlaanderen-Mercator where he became a pro in 2008. In 2009 he finished 3rd in the Belgian Championships and 3rd in Paris-Brussels. AG2R La Mondiale presents him as a sprinter/classics rider and we will thus probably see him in several races early in the season. 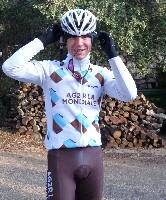 David Le Lay (30 December 1979), like Maxime Bouet, comes from Agritubel and joins AG2R La Mondiale for a 2 year contract. 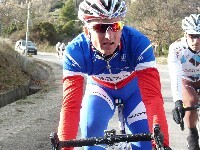 Le Lay, a puncheur, started his professional career in 2005 in the Bretagne-Jean Floch team. This team became Bretagne Armor Lux in the mean time but it was still with that team that he won the Tour du Finistère and the Trophée des Grimpeurs in 2008. He's than borrowed to Agritubel for the second half of 2008 and participes in the Tour de France for that team. He remains loyal to that team until it disappears. In 2009 he won the Trois Jours de Vaucluse and a stage and the general classification of the Circuit Sarthe-Pays de la Loire. He finished 2nd in the Route Adélie and in the 4 Jours de Dunkerque. Anthony Ravard (28 September 1983) is a French sprinter who also comes from Agritubel. After having become a professional rider with Bouygues Telecom in 2005, he joined Agritubel in 2007. In 2008 he has his best year there: that year he won the 2nd, 3rd and 4th stage of the Tour de Normandie, the 1st stage of the Circuit de la Sarthe and the Châteauroux Classic de l'Indre. In 2009 he won a stage of the Tour du Poitou-Charentes and he finished 2nd in the Tour de la Somme and 3rd in the Chateauroux Classic de l'Indre. With the 21 riders who remain, the AG2R-La Mondiale team is composed of 28 riders with 12 different nationalities. Among these riders I of course mention Cyril Dessel (29 November 1974), Rinaldo Nocentini (25 September 1977), Jose Luis Arrieta (15 June 1971) and Vladimir Efimkin (2 December 1981). And of course not to forget Nicolas Roche (3 July 1984) which Team Sky tried to get, despite the contract which linked him for another year to AG2R La Mondiale. Vincent Lavenu, the manager of the team, said about this: We did everything we could to keep him. Indeed, his salary was raised and his contract was extended until the end of 2011! The other riders of the team who stayed are: Guillaume Bonnafond (23 June 1987), Hubert Dupont (13 November 1980), Alexander Efimkin (2 December 1981), Martin Elmiger (23 September 1978), John Gadret (22 April 1979), Sébastien Hinault (11 February 1974), Blel Kadri (3 September 1986), Yuriy Krivtsov (7 February 1979), Julien Loubet (11 January 1985), René Mandri (20 January 1984), Lloyd Mondory (26 April 1982), Christophe Riblon (17 January 1981), Nicolas Rousseau (16 March 1983), Gatis Smukulis (15 April 1987), Ludovic Turpin (22 March 1975) and Tadej Valjavec (13 April 1977). Concerning the goals of the team for 2010, Vincent Lavenu said: Our main goal this year of course is to be good at the Tour de France, just like the past few years. In addition to that we have to win right from the start of the season in big races like Paris-Nice, the big international classics like Milan-San Remo, Liège-Bastogne-Liège or Paris-Roubaix. Concerning the fact that AG2R La Mondiale is one of the last French teams with a UCI ProTour license in 2010 (together with Française des Jeux) he explained that the team must defend French cycling and its strong values, while getting good results at the highest level. That will be our difficulty. The teams which didn't get a UCI ProTour license, Bouygues Telecom and Cofidis, will react to show that they are at the highest level as well. We warned our riders. They'll have to show that the comfort of having a Pro Tour license doesn't have a bad influence on performance. 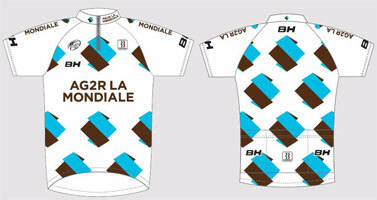 Indeed, AG2R La Mondiale has a ProTour license which is valid until the end of 2012. Interesting to see that the team got a huge inflow of talent. Hopefully they'll be able to fit the new guys in quickly and have a good year. Realistically I don't think the international classics MSR, P-R and LBL are within their reach. I think they'll do better to target stage wins in high profile stage races and overall wins in lesser stage races and one-day races and the French cycling calander. j'adore une course qui s'appelle l'ag2r qui part de ma ville Concarneau et j'aimerais bien être rensaignée par e-mail au niveau du classement de la course en 2010. Merci.